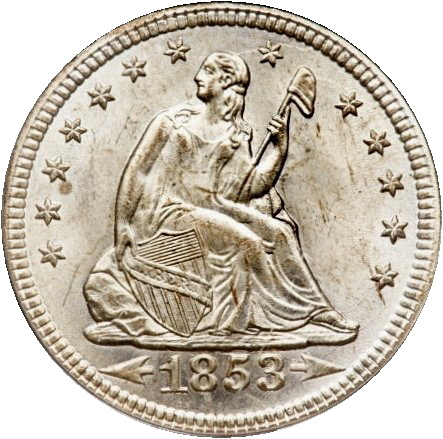 The 1853/4 quarter (PCGS Coin #5427) is a readily available coin that is listed in major catalogs and price guides. The attribution points are the bar of the 4, which appears under the 3 in the date, and a notable repunching of the right arrow. 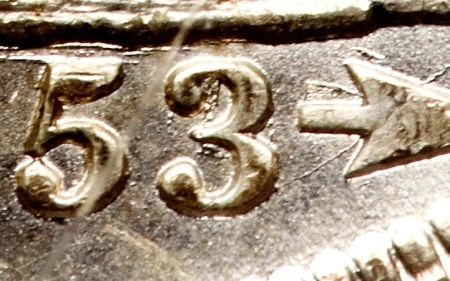 There is some debate regarding whether the underdigit is truly a 4, or possibly something else. The strength of the bar under the 3 digit, whether or not it is the upright of a 4, varies considerably, making the repunched arrow the more dependable attribution point. A total of 26 examples were reported in the 1993 LSCC survey and 31 in 2007. 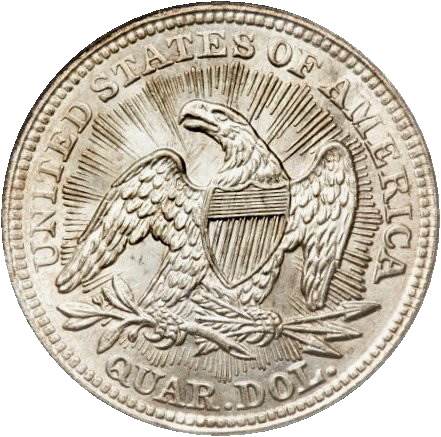 Though it represents a very small percentage of 1853 Arrows and Rays quarters, with some patience the variety can be found in almost any grade desired. The collector seeking an interesting, yet inexpensive, seated quarter variety might do well to consider a nice example of the 1853/4.